Andy Bellatti's take on Gary Taubes and carb-o-phobia. Carl Zimmer in the New York Times explains the difficulty of correcting bad science. Travis from Obesity Panacea and Colby from Nutritional Blogma diss the Chocolate Milk Diet. 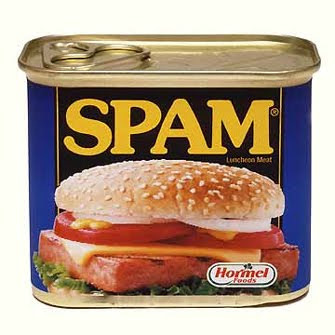 If you like Spam, you shouldn't read this article from Mother Jones. Colby Vorland from Nutritional Blogma explains a recent paper that suggests our increase in caloric intake comes from increased eating occasions.